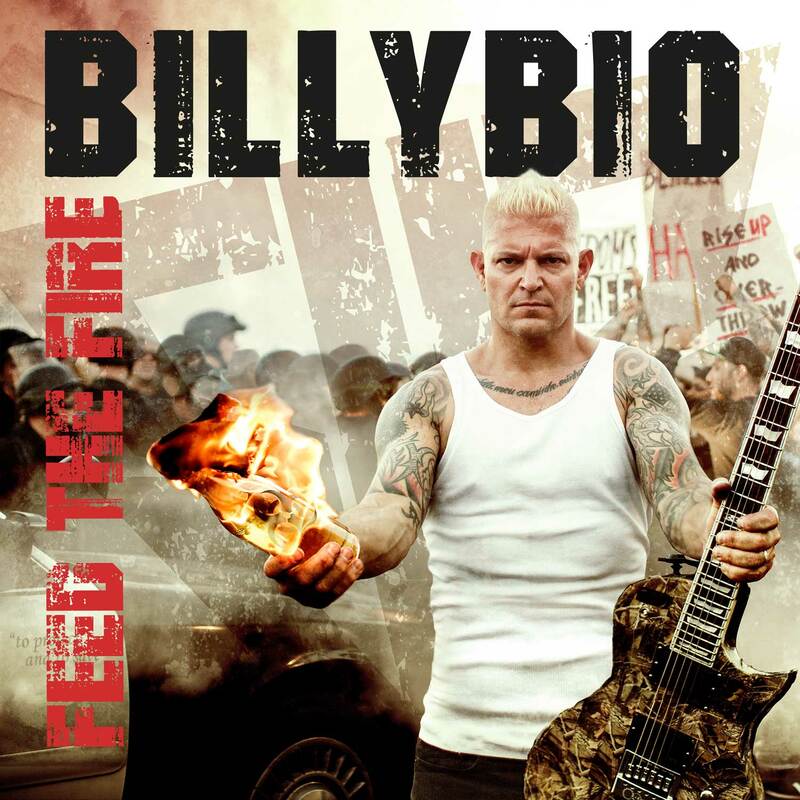 Billy Graziadei (Biohazard and Powerflo) is set to unleash his first solo album, "Feed The Fire"
Billy Graziadei (Biohazard and Powerflo) is set to unleash his first solo album Feed The Fire at the end of the month and will be taking it on the road for a US and Canada tour. I caught up with him for a little chat about the upcoming album and all things BillyBio! ANTIHERO: You’re due to release your first solo album, Feed The Fire, under the BillyBio moniker on 30th November – how would you describe your solo material and sound in comparison with what you’ve produced with Biohazard and Powerflo? BillyBio: My releases have always been 100% me. I love how a band works, the whole equals the sum of its parts. For me though, this is like a painter who throws all the colors on a canvas then invites a few mates over for beers and hands them the paintbrush and drunkenly asks them to change what they want! BillyBio is all of me, whole to the core in all its naked truth! ANTIHERO: The first single to be released from your debut album is called ‘Freedom’s Never Free’. What’s the track about? BillyBio: The obvious price in all due respect is what everyone always pays homage to. There are hidden prices to pay for freedom and I hit on them with this song. I’ve always been and always will be about standing up for those without a voice. Respect for those with a differing opinion is what we’re lacking in my view. I don’t want to live in a world where everyone agrees with me or thinks the same as I do. I also don’t want to live in a world where I can’t speak my mind and share my opinion! ANTIHERO: Your early musical training began with classical piano. What inspired the development of your musical tastes that drew you into the underground punk-rock scene? BillyBio: Punk rock taught me many things, the biggest take away was that it didn’t matter what you played, it is how you play it! I learned quickly that the notes weren’t as important as the message, and that rang loud to me! As an artist and producer, I’d rather have imperfection loaded with emotion than perfection without feeling! ANTIHERO: In 2016 you formed Powerflo with Cypress Hill singer SenDog, together with bassist Christian Olde Wolbers (Ex-Fear Factory) and guitarist Roy Lozano (Downset). Why did you decide to embark on a solo venture now? BillyBio: Maybe a part of me has always been solo. I love what I create with Biohazard and Powerflo (and the many bands I produce) but like the painter story, this is pure Billy Graziadei aka BillyBio, and that I love! I’ll die doing this! ANTIHERO: You’ve collaborated with many different musicians, is there anyone you haven’t worked with yet that you’d like to? ANTIHERO: With an audio engineering Degree and years of experience recording with Biohazard, you set up Firewater Studios and produce music by other up-and-coming bands. How does producing other artists’ material compare to producing your own? BillyBio: My ego is less emotionally tied to working with other artists than on my own work. Writing with other artists is something I really love but it doesn’t fill the void of creating something on my own. ANTIHERO: What’s been the highlight(s) of your career so far? BillyBio: Hahahaa…what I’m doing right now! It always has been. One of the few credos I live by besides being impeccable with my word is, always do my best! ANTIHERO: You’re taking your new album on the road for an 11-date tour of the US and Canada. Is a UK tour on the cards? BillyBio: Eleven dates rock! I’m thankful for one but this is just the beginning. I’m working on getting back to the UK, hopefully, it will be during the coldest and darkest part of the winter! Working on late January and early February right now… Stay tuned to my sites for more info! ANTIHERO: You’ve been touring around Europe with Life Of Agony. How has the tour been going and where would you say you have the biggest fan-base? BillyBio: The tour was great, we grew up together and practically went through puberty together so the tour was filled with a lot of great times and laughs. It’s been like the early days of Biohazard for me. Back then no one knew who we were so there were a lot of crossed arms and odd looks for the first few songs. Then the heads started to bob, then bang… a pit starts, it’s the same everywhere. I love the exchange of energy and wouldn’t trade it for the world. I’m blessed to be part of an awesome scene! Lovin’ it! ANTIHERO: What are your plans for 2019? BillyBio: Touring, touring and touring! Working on new Powerflo between the tours then going back out again! See you in the pit!